In the natural cycle of life a hen lays eggs, hatches them and raises the chicks until they are about eight weeks old when she will abandon them. Broodiness is a perfectly natural, hormone induced, instinct in any laying hen. However, unless you are intending to hatch chicks, it is a trait that should be discouraged as having a hormonal hen to deal with can be detrimental to the usual dynamic of your coop and can also affect the hen’s condition unnecessarily. Although it is not unusual for hens to go broody at anytime of the year the onset of Spring is still the peak of activity. Tell-tale behaviour can include excessive visits to the nest box during the day or sitting in the nest box for long periods of time. 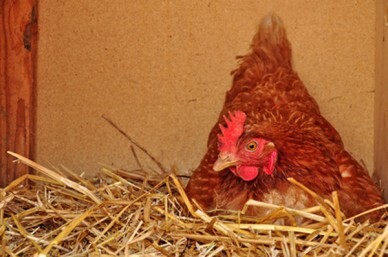 A broody hen will usually take possession of a nest box and not allow any others to use it, they may also put in a lot of effort arranging nesting material by clearing the floor and raising the sides all around her. By doing this she is preparing the area to keep heat inside the nest and prevent draughts. When she is ready to sit, she will pluck feathers from her abdomen to quite literally ‘feather her nest’ making it warmer and allowing her to feel the eggs on her skin. The bald patches left are known as ‘broody patches’. Other signs that a hen may be broody are a tendency to pick up some of the bedding in her beak and throw it over her back – again this is to build the sides of the nest and you may notice a rise in her temperature, especially around the abdominal areas. Some ‘broodies’ will allow all comers to lay in their nest and will sit on as many eggs as they possibly can, stretching their wings and spreading themselves as widely as they can to cover them all. A truly broody hen will even sit on golf balls, ping pong balls or stones! Broody hens are extremely self-centred and strong willed, even to the point of aggression. They will want to sit on the eggs almost constantly, taking only brief breaks for food and the toilet. They will sometimes have to be physically lifted off the eggs by their owners and put in front of food and water to make them eat and drink. During this time you can expect the hen to pass a very large amount of strong smelling ‘broody poo’ which has been stored inside her whilst sitting on the eggs. You can expect them to lose weight as they will not stay out of the nest for longer than is absolutely necessary, so consequently food intake is reduced. If you try to collect the eggs you could well be met by a very aggressive hen who will puff up her feathers in order to make herself look bigger. She will growl at you, peck you and may even screech like a banshee, as you attempt to remove her ‘babies’ from her nest. Other hens that approach her can expect the same reception. Some breeds, such as Silkies or Pekins are more likely to go broody than others. Hybrids are supposed to have had broodiness bred out of them but, as in all situations in which nature has a hand, don’t be surprised if occasionally you find an exception to the rule. With this in mind here are two lists one of breeds that commonly exhibit broodiness and one of those less predisposed. Note: Castrated males can go broody with the arrival of baby chicks, showing that broodiness is not limited to females however, castrated males do not incubate eggs. There are three methods commonly used to break a hen of broodiness. One only works if the hen is not entirely set on sitting e.g. a very young hen or one that hasn’t been laying for long. It definitely won’t work on a seasoned broody. In this situation just regularly lift her off the nest, put her near food and water, then remove the eggs. She may go back a few times but should eventually give up. Young inexperienced layers need careful observation as, in following their natural instincts, they can easily break eggs by walking on them or just by clumsily re-arranging them. The other methods are much stricter and may seem a little cruel, but they usually work within a couple of days with no actual harm done to the hen. The aim with both is to reduce increased body temperature which breaks the broody instinct. The first method is to take a deep dish or container large enough to fit the hen into completely, three quarter fill it with cold water; not ice cold nor cold straight from the tap, but it must be much cooler than the hens’ body temperature. Holding her firmly, and facing away from you, simply dunk her lower half into the cold water only for long enough for her feathers to become really wet. This treatment is best done on a warm day so that she doesn’t chill or catch a cold. Sometimes this only needs to be done a couple of times to solve the problem but there will be occasions when several attempts will need to be made. Assuming that a cold bath doesn’t work another tried and tested method is to place the hen in a container such as a dog crate, or anything with a slatted floor, in which she cannot get comfortable. The crate should be set on bricks or blocks to allow cool air to flow freely in and around the hen, particularly from beneath, to cool her ‘bits’. Keep her in a cool, shaded area close to the others so that there shouldn’t be any reintegration problem and she must be returned to the coop at night to sleep with the other hens. Food and water will need to provided in the crate. Two or three days of living in an uncomfortable environment is usually sufficient to break her broodiness. You can test this by putting her back in with the general population and watching to see if she heads straight back to the nest, if so then a few more days will be necessary.